Life is both a shared and a personal experience. Moments become memories that together form narratives both true and untrue, made incapable of being viewed in totality by the impairments of perception and sheer logistics. Our best hope of capturing the fullness and richness of a person’s existence—however chimeric a task that might be—lies in artistic expression. With bold ambition to do just that, to tell the story of one woman’s life with honesty and integrity, playwright Stephen Belber’s “Joan”, which opened last night in a Colt Coeur production at HERE, offers a kaleidoscopic look at its fictional, titular character through a lens of sweeping longitude that slowly creates an absorbing and dramatically effective portrait, at once banal and spellbinding. Joan (Johanna Day, “Sweat”, “August: Osage County”), as it happens, is a photographer. And so it is that “Joan”, much like our memory, is a photo album revealing a story edited from the benefit of its completion, where each moment means more in playback than it could ever appear to have been in context. At rise, Joan sits by a window, curtain flapping with the wind, and says: “there are times, as we live ... when who we are, and who we want to be, don’t match up”. Told as a non-linear series of snapshot scenes, the play follows Joan from a visit to an abortion clinic at age 22, to a conversation with her mother at age eight, to a photo session with a French model on a roof in Bulgaria at age 17, and so on and so forth—the Joan we see changing over time, matching and un-matching, but always becoming. It is easy to imagine how in lesser hands this structure might come across as facile and disjointed, but Ms. Day is a treasure of the stage whose performance is imbued with a naturalism that allows Johanna the actor to simply disappear and be replaced by Joan the character, a full-bodied person, graced with history, thought, and complexity. Joan at each age is a different person, but, of course, the same, shaped by what has come before, ignorant of what is to come. Johanna Day. Photo Credit: Robert Altman. Ms. Day is fortunately paired with two chameleons as scene partners, the simply named Man (Adam Harrington) and Woman (Marjan Neshat), who easily play some dozen characters in this montage of mostly two-character scenes. Mr. Belber smartly layers these supporting character tracks, reflecting the way in which multiple people in our lives unknowingly fulfill the same roles over time. Among his many parts, Mr. Harrington is alternately Joan’s brother, who dies at 36 from AIDS, and her son, who is born when she becomes a single mom in her 40s—two men who love and challenge Joan like no other. Ms. Neshat is Joan’s mother who abandons her children, and a journalist lover with whom she attempts to fill the void, among other roles that require her to be French, Polish, and Pakistani. Both supporting actors flow seamlessly from character to character, aided by Adrian Campbell-Holt’s fluid and focused direction, and a mood setting light-scape by Grant W. S. Yeager that feels essential to the storytelling. A mostly bare stage bounded on left and right by walls of peeling paper and plaster, and a brick wall at back, features only a yellow wingback chair, a metal folding chair, a stepstool, a lamp, and a camera on a tripod (set design by Andrew Moerdyk), and sets an appropriately ethereal and magical quality to this time-hopping piece. Adam Harrington, Johanna Day, and Marjan Neshat. Photo Credit: Robert Altman. One annoying quirk of Mr. Belber’s text is his repeated insertion of bluntly expository language into each vignette as a way of telegraphing Joan’s age and situs. I wish there were an easier way to assuage audience curiosity than by having the character unnaturally tell us this information, because it is helpful, though not always essential, to know. “Joan” does not weave a mystery, nor result in some pat message or reveal as a button. Instead, it is about a person’s existence from childhood to deathbed, and all the attendant love, loss, and learning in between—no matter how pedestrian or occasionally poetic. The through-lines are clear. The crossroads familiar. 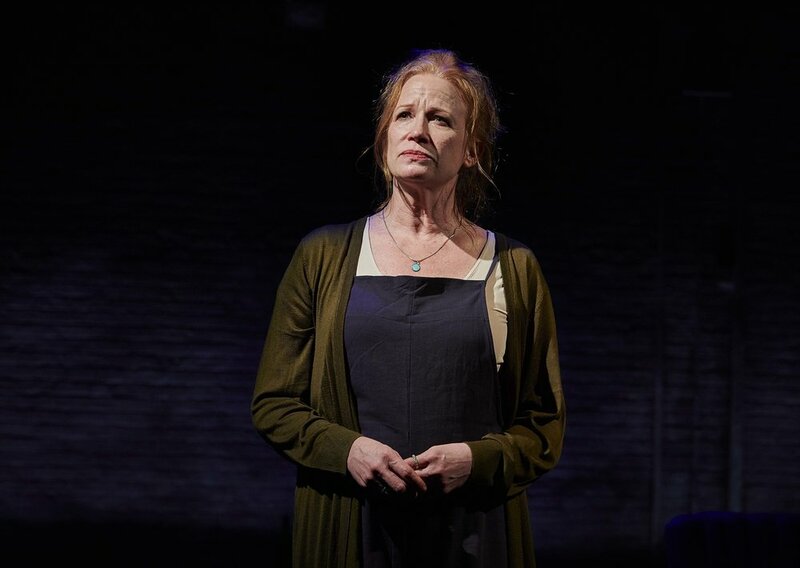 This may seem like uninspiring grist for a drama, but the portrait of humanity painted by Mr. Belber’s play—especially given Ms. Day’s exquisite performance—is moving precisely because of its simplicity and ordinariness. Every person has a story. Joan’s is worth seeing. Bottom Line: in “Joan”, playwright Stephen Belber ambitiously sets out to tell one, non-linear story of a woman’s life that slowly creates an absorbing and dramatically effective portrait, at once banal and spellbinding. Johanna Day is exquisite as the titular character, supported by two chameleons who play all the supporting roles. The drama is straightforward, and the production taut.